367 pages | 131 B/W Illus. Informatics in Medical Imaging provides a comprehensive survey of the field of medical imaging informatics. In addition to radiology, it also addresses other specialties such as pathology, cardiology, dermatology, and surgery, which have adopted the use of digital images. The book discusses basic imaging informatics protocols, picture archiving and communication systems, and the electronic medical record. It details key instrumentation and data mining technologies used in medical imaging informatics as well as practical operational issues, such as procurement, maintenance, teleradiology, and ethics. The technologies of medical imaging and radiation therapy are so complex and computer-driven that it is difficult for physicians and technologists responsible for their clinical use to know exactly what is happening at the point of care. Medical physicists are best equipped to understand the technologies and their applications, and these individuals are assuming greater responsibilities in the clinical arena to ensure that intended care is delivered in a safe and effective manner. Built on a foundation of classic and cutting-edge research, Informatics in Medical Imaging supports and updates medical physicists functioning at the intersection of radiology and radiation. Because of the comprehensive nature of this book with many topics in medical imaging informatics, the targeted readers include professionals in medical physics and biomedical imaging, as well as students and researchers. It may also be used as a helpful reference guide for medical physicists, radiologists, and administrative staff seeking additional information on medical imaging informatics. …most chapters are well written and easy to read even for readers without much prior knowledge in medical imaging informatics. 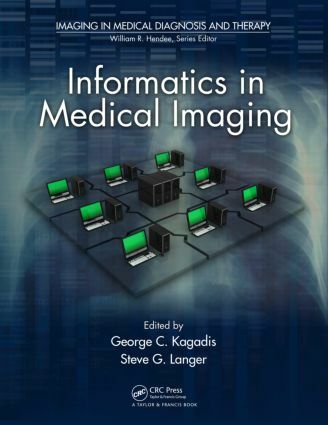 … the book provides a comprehensive survey of the field of medical imaging informatics. Overall, this book is well written by experts in their respective fields and has good coverage. Readers may also obtain a wealth of information in medical imaging informatics from references listed at the end of each chapter … . George C. Kagadis, Ph.D. is currently an assistant professor of Medical Physics & Medical Informatics at the University of Patras, Greece. He received his Diploma in Physics from the University of Athens, Greece, in 1996 and both his MSc and Ph.D. in medical physics from the University of Patras in 1998 and 2002, respectively. He is a Greek State Scholarship Foundation grantee, a Fulbright Research Scholar, and a Full AAPM member. He has authored approximately 70 journal papers and had presented over 20 talks at international meetings. He has been involved in European and national projects, including e-health. His current research interests focus on IHE, CAD applications, medical image processing and analysis as well as studies in molecular imaging. Currently he is a member of the AAPM Molecular Imaging in Radiation Oncology Work Group, European Affairs Subcommittee, Work Group on Information Technology, and an associate editor of Medical Physics. Steve G. Langer, Ph.D.is currently co-director of the radiology imaging informatics lab at the Mayo Clinic in Rochester, Minnesota, and formerly served on the faculty of the University of Washington, Seattle. His formal training in nuclear physics at the University of Wisconsin Madison and Michigan State has given way to a new mission: to design, enable, and guide into production high-performance computing solutions to implement next-generation imaging informatics analytics into the clinical practice. This includes algorithm design, validation, performance profiling, and deployment on vended or custom platforms as required. He also has extensive interests in validating the behavior and performance of human and machine-based (CAD) diagnostic agents.